The 10th Street Galleries were a cooperative set of artist-run art galleries that began opening in the early 1950s in New York City. While more established galleries like the Janis, Castelli, Levy and others were all operated by wealthy art dealers and mostly located along Manhattan's opulent 57th Street, the 10th Street Galleries were simple, small, un-staffed, and relatively modest. Many established artists of the era, like de Kooning and Kline, had studios in downtown Manhattan, and their very presence attracted younger artists to the area where studio and gallery space was cheap and plentiful. Until the galleries' arrival, the small block on 10th Street between 3rd and 4th Avenues was populated by pawn shops, poolrooms and sheet-metal shops. In the autumn of 1952, the first two of what would be several co-op art galleries opened in downtown Manhattan; the Tanager on 90 East 10th Street, located next door to the home of Willem de Kooning, who had recently taken an apartment on 10th Street, and the Hansa on 70 East 12th Street. The founders and original artist-members of these galleries were relatively unknown (and to this day it is difficult to identify each individual associated with these initial galleries), and they were not necessarily Abstract Expressionists. Membership at the Tanager included American Realists Alex Katz and Philip Pearlstein, and the Pop art/found-art collagist Tom Wesselmann. Among Hansa's members were Color Field painter Wolf Kahn, collagist and performance artist Alan Kaprow, and Pop artist George Segal. Critic/historian Meyer Schapiro was a regular visitor to the gallery. The opening of these galleries were momentous occasions for the downtown arts scene in New York. Before this time, the artists of the New York School created art, attended lectures, and socialized in and around 10th Street (at the Cedar Tavern, the Artists' Club, The New School, etc. ), but to show their work they tended to find representation with uptown gallery owners and/or art dealers on 57th Street or Madison Ave. The Tanager and Hansa galleries offered open spaces for young artists not only to show their work, but also provided a location for young newcomers to represent themselves and to sell art on their own terms, unconstrained by the dealers and uptown gallery owners. The James Gallery opened in the fall of 1954 on 70 East 12th Street, in a space previously occupied by the Hansa Gallery. Immediately preceding the James opening, the Hansa relocated its space to 210 Central Park South, marking the first departure of a 10th Street gallery from downtown to uptown Manhattan. Some notable members of the James were the photographer Phillip Harrington and the portrait artist Margaret Bartlett. By the mid-1950s, the first generation of Abstract Expressionists was well established in the New York art world. Some members had become extremely wealthy from their work and were given frequent solo shows at the uptown galleries, and some had even passed away. The second generation of AbEx artists emerged, and the 10th Street galleries were the ideal place for them to show their work, aided by those such as de Kooning and Rosenberg - both of whom lived on 10th Street - who were frequent visitors and promoters. The Tanager was unquestionably the premier gallery of the 10th Street co-ops. Not long after opening, it counted among its membership Willem de Kooning, Rudy Burkhardt, Al Held and Philip Guston. In the fall of 1956 the Camino Gallery opened its doors on 92 East 10th Street (a building that has since been torn down), with a membership of over two dozen artists, including John Krushenick (a former student of Hans Hofmann's and a co-founder of the soon-to-open Brata Gallery), his brother and fellow artist Nicholas, and Elaine de Kooning. The following March, a new gallery opened across the street from the Camino, dubbed the March Gallery, on 95 East 10th Street. Elaine de Kooning, best known during the 1950s and early 60s for her abstracted portraits, was the ideal ambassador for some of the smaller downtown galleries with little to no public exposure. As a woman artist in the male-dominated New York School, most high-profile gallery owners and dealers were not clamoring to exhibit and sell her work, but her paintings were so widely admired and celebrated that having her name attached to a gallery did boost its profile. Two notable events occurred on 10th Street in 1957. First, the Brata Gallery opened on 89 East 10th Street, founded by artists who had left the Camino Gallery. The Brata hosted the first poetry readings and jazz performances of David Amram and Jack Kerouac. The second event was the Tanager Gallery's series of forums with local artists, established in an attempt to categorize different approaches to art and to address emerging styles and philosophies. 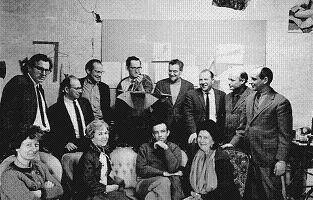 Irving Sandler, the Tanager's former manager, recalled such evenings at the gallery: "Those in regular attendance were Charles Cajori, Lois Dodd, Sidney Geist, Sally Hazelet, Angelo Ippolito, Ben Isquith, Alex Katz, Philip Pearlstein, Raymond Rocklin, and myself as a note taker and tabulator. They decided to avoid existing labels, such as Abstract Expressionism, Abstract Impressionism, and Action Painting, which, they claimed, were the outworn inventions of critics." The intention of these forums, which also included contributions from Philip Guston, Fairfield Porter, Willem de Kooning, Franz Kline, Mark Rothko and Joseph Cornell, was to publish a book containing conversations between artists who would discuss their various objectives, processes and products. The book was never published. Most likely the cause of its failure was the Tanager members' refusal to include Elaine de Kooning in the forums, which enraged Willem and prompted him to drop out. "Given his prestige," Sandler commented, "that was enough to bury the project." By the late 1950s, the block of 10th Street between 3rd and 4th Avenues had become somewhat crowded. The Hansa had moved uptown and the newly opened Phoenix Gallery would soon follow suit in 1962, but this small piece of Manhattan was at the time overrun, not only with painters looking to ply their wares, but also poets, sculptors, Conceptualists, photographers and musicians. Like Greenwich Village of the 1930s and 40s, Manhattan's 10th Street was, in the 1950s, the preferred gathering place for young artist-bohemians who sought like-minded individuals. The 10th Street galleries had become more than mere art spaces; they were the center for anything new and avant-garde in downtown Manhattan: art installations, "happenings," impromptu jazz sessions, poetry readings, performance art, and more. Some have credited the 10th Street galleries - Phoenix, Area, Grimand, Reuben and others - that opened the late 1950s as the collective birthplace of the famed Beat generation of poets, writers and musicians. In 1963 the small co-operative, Park Place Gallery, was established, first opening in Park Place in lower Manhattan, then settling in its permanent location in the Manhattan neighborhood of SoHo. This was the first art gallery located in this neighborhood, and marked a major turning point for downtown galleries, now ubiquitous in sections of SoHo and Chelsea. The Park Place was not a small gallery, however. Specializing in Geometric Abstraction, Op Art, Hard Edge painting and Minimalism, the gallery became a popular location for young artists such as Sol LeWitt, Robert Morris and Robert Smithson. If the second generation of Abstract Expressionists had a home, it was on East 10th Street in Manhattan. Shedding the quaint beauty that was Greenwich Village, the young generation of New York artists built a new art world from scratch, on a destitute city block that was little more than a scrap heap before their arrival. With this new environment in which to experiment, Abstract Expressionism gave way to new styles and media that further challenged the boundaries of what was considered art; installations, performance and body art, "happenings" and several other art forms were all conceived of on the small block along East 10th Street. "Tenth Street: A Geography of Modern Art"
In his essay, "Tenth Street: A Geography of Modern Art," Harold Rosenberg identified the sea change of 1950s New York from old bohemia to the new avant-garde. The Greenwich Village crowd resided in what Rosenberg called an imitation Paris; the new bohemia was now situated along the anti-picturesque 10th Street, with small but bustling galleries and studios run by newcomers with nothing to lose. Rosenberg observed that, "everything on 10th Street is one of a kind: a liquor store with a large 'wino' clientele; up a flight of iron steps, a foreign-language club restaurant; up another flight, a hotel-workers' employment agency; in a basement, a poolroom .. the modernism of 10th Street has passed beyond the dogma of 'aesthetic space,' as its ethnic openness has transcended the bellicose verbal internationalism of the thirties. Its studios and its canvases have room for the given and for the haphazard." The generation of Willem de Kooning, and the subsequent generation of New York School artists, preferred a setting in which to create art that lacked the pre-fabricated scenery of Greenwich Village and instead was more of a blank template on which to make their mark. Alfred Jensen's development as an artist was two-fold; he traveled to Paris at a young age and schooled himself in the European greats, particularly Picasso, and upon returning to the U.S. he developed friendships with New York artists such as Willem de Kooning, Robert Rauschenberg, Joseph Cornell and Franz Kline. After being invited by some of his new cohorts to participate in a 1954 group exhibition at the Stable Gallery, the young Jensen had his very fist solo show at the Tanager in 1955. As a former student of Hans Hofmann's, much like many of the artists associated with the 10th Street co-ops, Jensen applied a formal and basically pure approach to his work, relying on bold colors and simple optical effects. As one of the founders of the Hansa, Kaprow and his partners made it clear from the beginning that their gallery would have no fixed aesthetic or style. Kaprow's own work tended toward gestural abstraction, installation, and Action Painting with a preference for collage. More simply, he was a practitioner of multi-media who used art to evoke a gritty urban landscape, and to instill a sense of discomfort, cohering naturally with the atmosphere of 10th Street. This 1958 show, his second or third solo exhibit at the gallery, occurred not long before Kaprow left to join the Reuben Gallery, where he helped pioneer the "happening," a multimedia performance and installation project that greatly influenced art movements of the 1970s. The Japanese avant-garde artist Kusama first arrived to New York in 1957 and soon became a peer of the Minimalist Donald Judd and Dan Flavin. While her early work, like No. F (1959), were mostly standard oil paintings, she was widely celebrated in subsequent decades for working with a variety of media, from fashion and jewelry to sculpture and installation art. This show at the Brata, her first solo exhibition, introduced the art world to her brand of condensed and tightly-wound hallucinatory visions, or what she called "infinity nets," such as No. F (1959) and Infinity Nets Yellow (1960). Her use of repetition was also an important precursor to American Pop art. "The 10th Street galleries seem to be of great importance as an incubating center for young artists." - Alfred H. Barr, Jr.
"[The name] seemed appropriate..because of our debt of Hans Hofmann; also, it was the name of a medieval league of free cities which combined for mutual gain." "[10th Street] is hospitable to anything, except what might denote a norm."